All three and four year old children show curiosity and the need to investigate. They are energetic and inquisitive as they learn about themselves and the world around them. Our Preschool rooms (Suns, Moons, and Stars) will help them to answer many questions. They are refining their language skills and engaging in conversations. They are developing more sophisticated social skills; and enjoy being with other children. They want to have and be a friend. They are learning to share and wait their turn. They are beginning to understand that people are both alike and different in how they look and feel. When they play with blocks and in sand, water, and dirt they are learning about the physical world. When they role play (in Dramatic Play centers) they are working on making sense of their world. When they use free choice art materials they are learning to plan, use fine motor skills, complete a task, and to take responsibility for cleaning up after themselves. 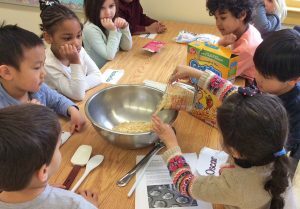 In Preschool we talk about feelings and manners, read and tell stories, sing songs, dance to music, do art projects, cook, garden, investigate math and science concepts, learn about colors, shapes, and sounds, and become even more independent. We also have a lot of FUN! We use seven developmental domains outlined in the Delaware Early Learning Foundations in planning our weekly curriculum to ensure success. The children in the Preschool classrooms use an independent management system to move freely between hands-on learning centers. Learning centers include, but are not limited to, science, art, math, manipulative, dramatic play, construction, writing and language, library, sensory and computers. Ultimately, teachers observe and assess children’s progress toward developmental milestones using the Teaching Strategies GOLD system. Information about assessments is shared at semi-annual family/teacher conferences. Generally, children in our Preschool Suns room are three years old, children in our Preschool Moons room are four years old, and our Preschool Stars room contains children of both ages. The Preschool Stars room may also include children who are here part-time. Otherwise, the three rooms use a similar structure. We welcome you and your child to Preschool and look forward to working with you to ensure a successful transition to Kindergarten.